Description: This is one of 6 Little People animated book VHS video stories of the Little People family consisting of Dad, Mom, Brother Jimmy (orange body/brown hair), Sister Penny (green body/yellow hair), Lucky (dog) and Baby Sister (white baby with hat). The book and video tells the story of a rained-out picnic that becomes a fun story telling session. This Video is not actually made by Fisher Price, but is licensed by them to "New World Video, produced by Marvel Productions, Ltd. - A New World Company". The story tells about how the Little People family learn the true meaning of Christmas. Designed for children ages 2 to 6 years old. 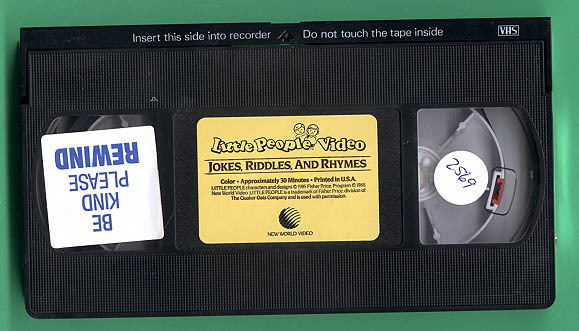 FPT5172 - Black 30 minute VHS (U.S. NTSC format) video titled "Jokes, Riddles, and Rhymes". WFL: 07-AA-02-0-D.
FPT5166 - Book titled "Jokes, Riddles, and Rhymes". The book has a soft cover with a picture of Jimmy knocking on a small door, and Baby, Penny, and Lucky the dog on the other side of the door. 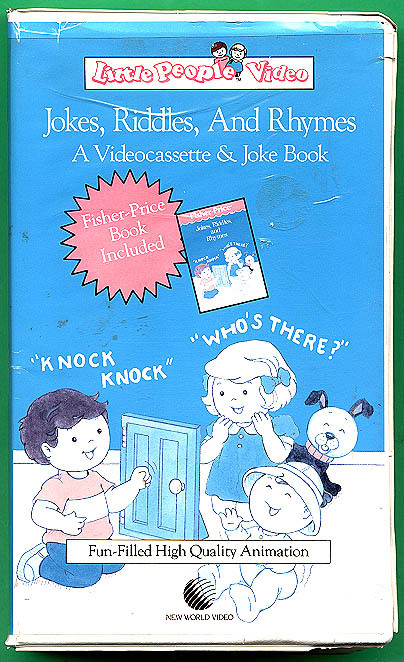 FPT5262 - White plastic video case titled "Jokes, Riddles, and Rhymes" to hold the FPT5172 "Jokes, Riddles, and Rhymes" VHS video. The case has a green cover with a picture of Jimmy knocking on a small door, and Baby, Penny, and Lucky the dog on the other side of the door. The top of the cover is marked "Little People Video". Also marked C50104. WFL: 07-AC-02-0-F.
FPT5294 - Mint (unopened) Set with video, video case, and book.